I hinted that the Prussians had made a subtle, but serious error in my previous post. 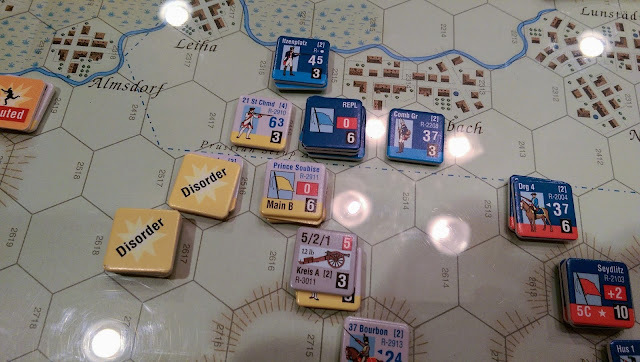 In this entry we'll see what they did, and how that combined with another unfortunate happening led to a surprising outcome at the Battle of Rossbach. During the 11:30 turn the Prussians, noting the move around their left and especially von Louden's advance on Leitha, begin a move to change their front. 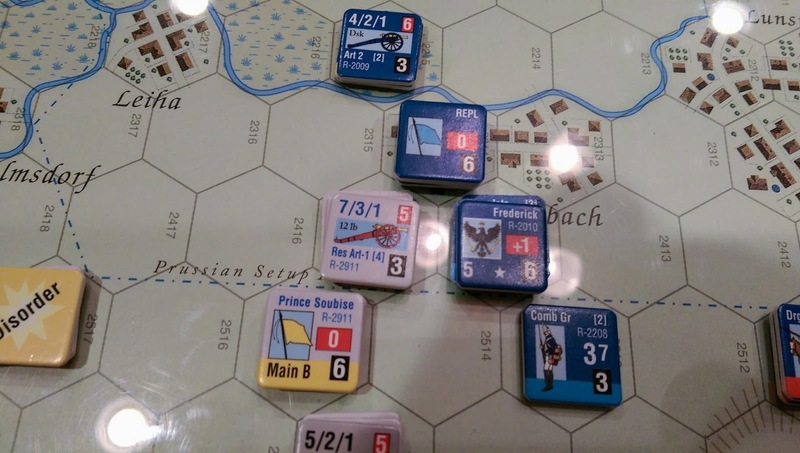 Frederick really can only use Mortiz's wing for this though, since Forcade's wing is engaged against St. Germain at Schortau. The absence of these troops will be keenly felt as the day wears on. While the cavalry fight swirls to the southeast, and the Franco-Imperial columns press past Pettstadt on their way toward Reichertswerben, St. Germain and von Lounden throw their light forces into attacks on Schortau and Rossbach. This is most definitely not what happened historically. Both St. Germain and Louden's forces sat in place on the Schortau Heights and Gallow's Hill respectively, attempting to screen the Allied advance, and took no significant part in the battle until the end, when they covered the Allied retreat/rout. In this case, the Prussians use the superior mobility of their light forces to abandon Schortau, and St. Germain's attack with the Conde brigade through the town, across the stream and up the hill is bloodily repulsed. With one brigade of his infantry routed and the other disordered, St. Germain is largely out of the fight for awhile. Loudon however has better luck attacking Rossbach with his Croats. Croats are light troops that evolve into the Grenzers of the Seven Years War and Napoleonic wars. An optional rule allows Croat units to snipe rather than engage in close combat. Combined with their designation as "fast units" this means that they can move in close, fire at regular infantry, and then get out of the way before being counterattacked in the next turn. Louden's Croats do exactly this, disordering the Prussian grenadiers occupying Rossbach. Unfortunately for the Allies, Seydlitz has made short work of their Advance Guard cavalry while maintaining most of his horse in good order. Seeing the Reichsarmee coming on in column, Seydlitz unleashes his heavy horse on them. Hildburghausen and his men desperately try to deploy from column in the face of the charging Prussian cavalry. To do this, they must roll a 1D6 and add their Efficiency rating, in this case a paltry two. This is then compared to a similar 1D6 roll by the Prussians, with their Efficiency rating (five) added. If the defender's total is higher, they can execute a forced deployment from column into line. Prussian cavalry are so well drilled at this they receive a +4 DRM. Imperial infantry are not well drilled. The Prussians win the roll, and Seydlitz's troops crash into the Reichsarmee columns. The Ferntheil Infantry Brigade is completely routed, the Prussians manage another sweeping charge and force a step loss and disorder on the Holstein Infantry Brigade, including the Blau Würzburg regiment. I don't know why I didn't grab a picture of this action! From the Franco-Imperial perspective, it now seems highly unlikely that they can force their way to Reichertswerben in the two hours remaining before they will lose the morale bonus. 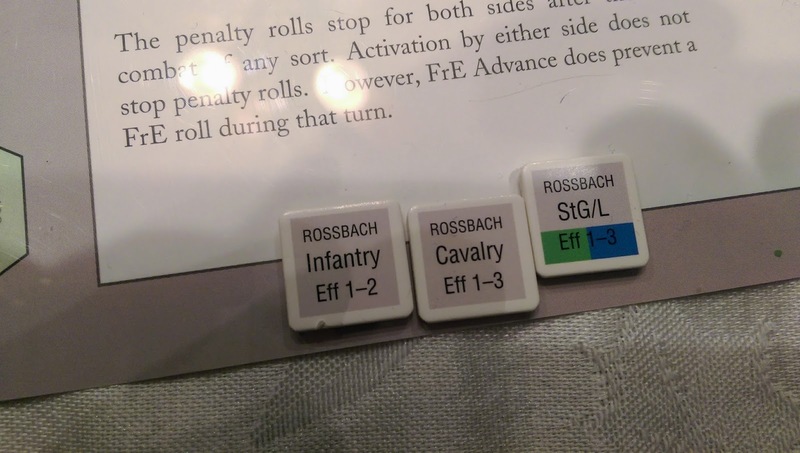 Getting charged by the Prussian cavalry or bombarded by the Prussian artillery now in Rossbach while in column doesn't seem terribly attractive either. At this point the only way to retain the morale bonus seems to be to deploy into line and attack, getting three Allied line infantry units adjacent to the Prussians. From 11:30 to 1:30 the Allied army deploys and maneuvers to come to grips with the Prussians, while also trying to rally their shattered Advance Guard and Reichsarmee troops. 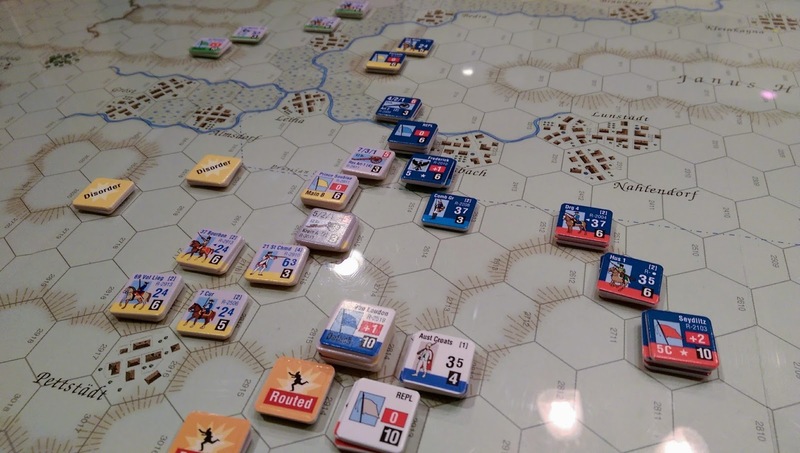 Louden moves to screen the exposed Allied right from the Prussian cavalry, ending up on the heights above and around Pettstadt. The Prussians spend the time rallying Seydlitz's cavalry and forming a line facing south from Rossbach, including a strong artillery battery. This is where the Prussians make their subtle mistake. 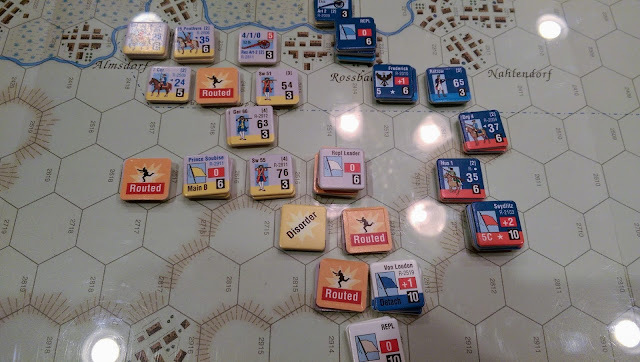 In reality, there was no real advantage for the Prussians to hold Rossbach. It seemed to me that the Prussians with their superior infantry would be able to crush the Franco-Imperial attack and rout them. Unfortunately doing this allowed the Allies to close and meet the conditions for maintaining the morale bonus. 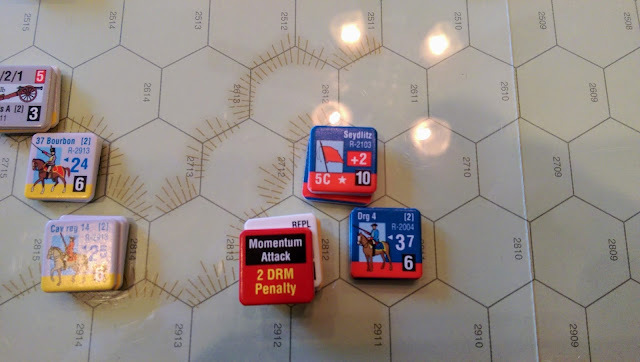 Simply pulling back a hex or two would have caused an immediate drop of eight points to Allied morale, putting them very close to having to roll for being demoralized. Instead Allied morale stayed high - and the Prussians would come to regret it. As the Prussians expected, the Franco-Imperial attacks didn't go well during the 1430 turn. Devastated by close range artillery fire and thrown back by the disciplined Prussian infantry, thousands of French, German, and Swiss soldiers take to their heels. 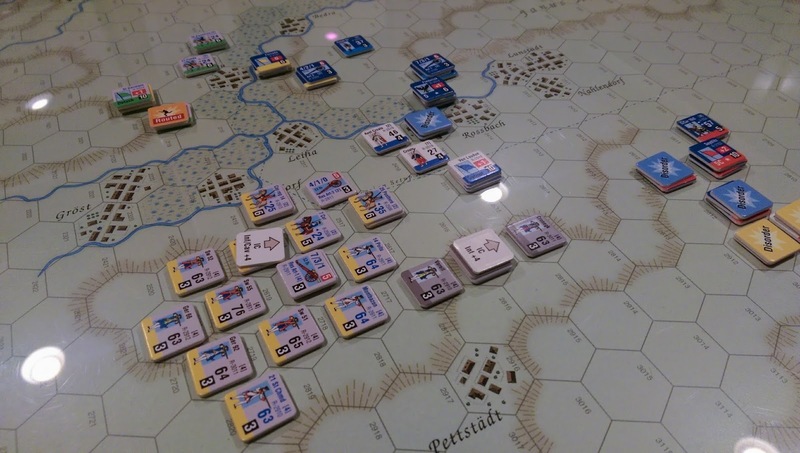 Hildburghausen is wounded and what is left of the Reichsarmee decides to call it a day. St Germain sits on the Schortau Heights, trying to rally his men while Louden braces for a cavalry charge. It doesn't look great for the Franco-Imperial Army. Morale is plummeting and losses are mounting. The Prussians, though, are starting to take losses. 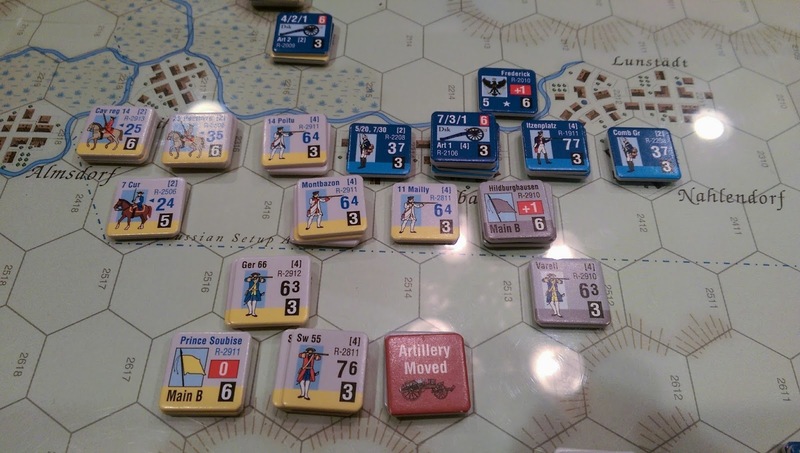 Artillery and an attack by Swiss brigades eliminate the grenadiers in Rossbach. Worse, the Prussian line infantry has taken some step losses even though victorious and Prince Moritz of Anhalt is wounded. The Prussians are winning but they are badly outnumbered, and all losses are felt. At 1530 the Prussians organize an oblique line facing west and move to strike the Allied left flank. With Prince Moritz hors de combat Frederick himself takes command of Moritz's wing. In game terms, the reason for this is that Frederick, as both Army Commander and a Special Leader has to actually be stacked with a wing in order to use his bonuses. This works out nicely as a means of simulating a leader personally coordinating an attack or defense, something Frederick (much to the alarm of his soldiers and generals) frequently did. It was a era of very personal leadership. 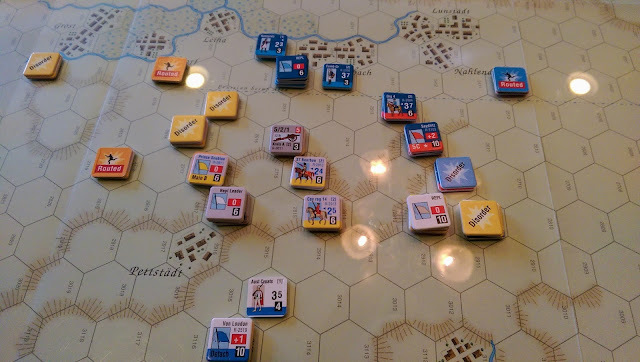 Finally convinced that St. Germain is not going to do much of anything, Forcade begins to move men and guns toward Rossbach to support the attack by Moritz's wing. The Allies have concentrated their artillery batteries on their left to oppose the Prussian attack. They are opposed by the Prussian artillery. The guns roar and the Prussian muskets crackle, and when the smoke clears the Prussians have carried the position, capturing all of the Allied guns deployed on this flank! But in the melee, Frederick has fallen. Not dead but wounded severely enough to have to be taken off the field. This is a grievous blow to the Prussians; not only is the army without any commander now (Moritz would have replaced Frederick were he not already wounded) a wounded Frederick is worth a whopping ten victory points to the Allies, the same as if they had managed to capture their original objective of Reichertswerben! As darkness begins to fall at 1630, Prince Soubise leads the remnants of the Franco-Imperial force in turning back the now leaderless Prussian advance. The Prussians are still dangerous but nearly all of their brigades are depleted now. There are still fresh French troops on the field, including French cavalry who move to oppose the Prussian cavalry along with Louden's troops. The western half of the field is a chaos of disordered and routing French, German and Swiss brigades but the Allied numbers are telling. The Franco-Imperial infantry pull back behind a screen of the French horse. In a final throw of the dice, the rallied Advance Guard cavalry charges the left of the Prussian horse, routing half the squadrons and disordering the rest. If not for their resounding success in combat the Prussians would be on the edge of having to roll for being demoralized. Due to their earlier morale bonus, the Franco-Imperialists are still in relatively good morale despite their losses. By 1730 neither side really has the infantry combat power to continue. The Prussians are in good order but have half the strength they had earlier. Seydlitz is in no mood to be trifled with however and charges the now disordered German horse in turn smashing them and again benefits from a sweeping charge. With the Advanced Guard cavalry now swept from the field the French horse charges Seydlitz's disordered squadrons (all cavalry that participate in close combat are automatically disordered) but are not terribly effective. And so the day ends with a swirling but largely inconclusive cavalry action while the main armies separate and lick their wounds. The butcher's bill for this alternate Rossbach was much higher for the Prussians than what they paid historically, and probably not as bad for the Franco-Imperialist forces. The toll on the Prussian leadership was particularly high - and would have probably changed history. A wounded Frederick and a wounded Moritz of Anhalt would not have been able to quickly march an army to Silesia and could not have led the attack on the Austrians at Leuthen. As a result, the Austrians would have probably regained Silesia permanently. Berlin would not just have been raided, but may have been seriously threatened with capture. The Prussians in the end did manage to cause enough casualties to demoralize the Franco-Imperial army. Given Frederick's wounding that was enough to save them from a serious loss, but no more. 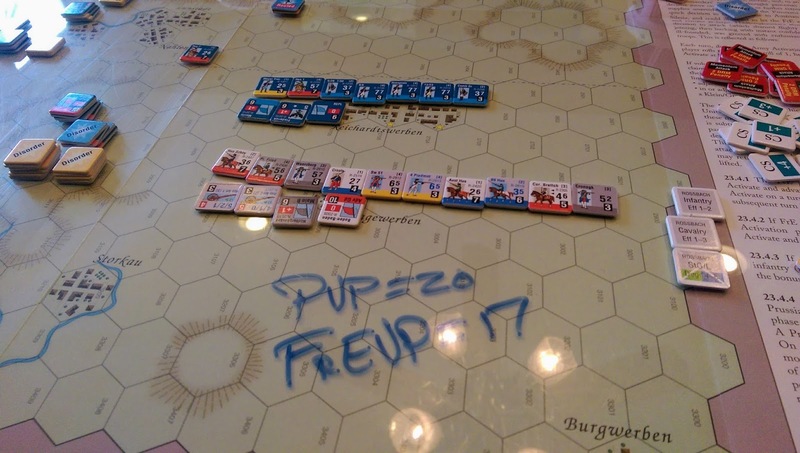 The final tally had the Prussians at 20 VPs and the F-E at 17 and demoralized; a minor Franco-Imperial victory. I think this battle ended up being an excellent illustration of some of the finer points of generalship in this era. The key for both sides was timing. The Prussians attacked too early, or at least should have avoided contact for another turn. 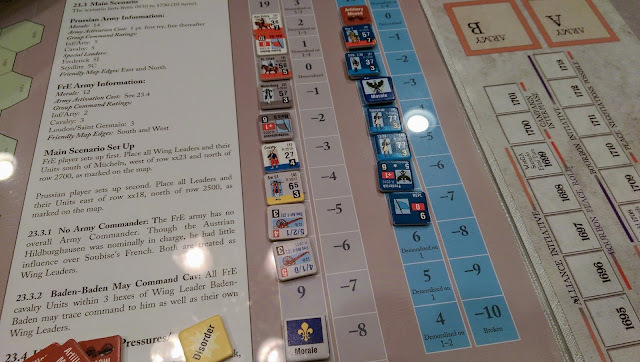 If they had, they would have almost certainly won, even with Frederick being wounded as the Allied army would have become demoralized and therefore unable to engage. For the Franco-Imperial army, the timing was in when to deploy from column and when to shift the objective. They did both of these at the right time, and staved off the defeat that they historically suffered. 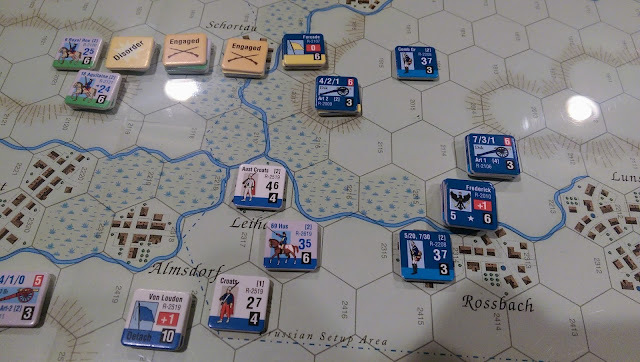 Artillery and cavalry both played a more significant role in this game than in previous games I've played in this series. That's not because of the scenario but more because I have a better idea how to use them now. I'm still far from satisfied about my skill in coordinating infantry-cavalry attacks. I felt I used artillery pretty effectively this time though, particularly for the Prussians. I continue to really enjoy these games. They capture the period nicely and play quickly, even when playing solo. My tendency is too often to try and replicate the historical actions when playing games of this period, to see what really happened. When I can pull myself away from that, these are great games and simulations of Frederick's battles. Now, time to graduate to some Battles of the Age of Reason. My first batch of 2mm 3D printed minis has arrived! Here they are before being cut off of the sprues. 2mm - Here we go! Montpensier's column opens the battle with an attack on Aubervilliers using argoulets and cannon. Some initial thoughts on By Shot, Shock, and Faith from Hexasim, a game covering five battles from the French Wars of Religion. Status Update - A quick video covering the state of the channel and my associated blog.